I finally finished Chrono Trigger, and only 12 years late. Not too bad. Much like Super Mario World, this is another classic that deserves the accolades it has received. I only hope Link to the Past and Final Fantasy 4 are Chrono Trigger good. Though because of the game’s quality characterization, I am now slightly depressed. It has been pretty uncommon in my life, but now and then a game comes along that affects me like a great movie or novel does. Now that there is no more to see, what happens to the characters? 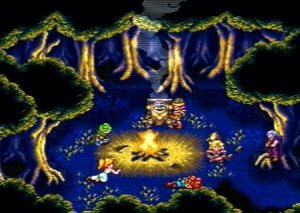 Crono, whose name is a typo because of the apparent five character limit in the game, was the standard silent protagonist and I don’t give a damn about him. But Frog, Magus, Lucca and Robo I do care about. The game’s ending was almost like these new friends’ deaths. Maybe it’s better this way since I’m still coping with the guilt of not saving Lucca’s mothers legs and trying to justify recruiting Magus even though it damned Frog to live and die in his current form. But those are the breaks of time travel, right? Some things need to happen and just because you can change something doesn’t mean you should. I hope Frog and Lucca see it that way, too. Chrono Trigger also reminded me of all the other dear friends who left me. Minsc’s absurd voice still plays in my head, often followed by Boo’s squeak. Morte’s one liners and Dak’kon’s philosophy are still lucid in my memory. Ryo Hazuki mattered to me more than any character in a GTA game ever did, say what you will of the game play mechanics in each. Even Twilight Princess, which was an excellent game, lacks any characters I really care about. I don’t care to know what else happens to that Link after the credits roll. But I honestly dread the last Ace Attorney game starring Phoenix Wright, and after every case closes I’m sad to see the participants go their own way. Chris Crawford argues that a good video game is interactive above all things. He may side with Miyamoto – Zelda doesn’t need characterization, it has awesome puzzles. This is true, yet ten years from now I won’t remember any of those puzzles. I still have scenes from decade old character heavy RPGs etched in my brain. I can see Alys on her death bed, and Rune and Chaz on top of a building discussing life while looking out at the stars. And now, I am certain that for many long years I will recall Robo traveling to a future in which he may no longer exist. Alys, Rune, and Chaz…that brings back memories. I think Phantasy Star IV was the RPG that got me interested in playing other RPGs. I love Chrono Trigger. One of my all-time favorites. 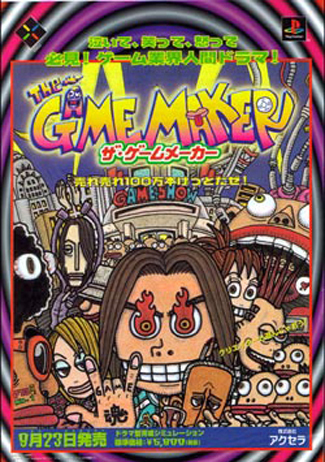 That was actually the first Square RPG I’d ever beaten, and it was a great achievement for me. I played it originally on the PS1, but later got the SNES version on ebay. Music was great, style was great, and I’m a huge fan of the whole time-traveling idea, like Back to the Future. Chrono Cross hints at the characters, but I don’t think you ever see them again. Not sure, as I was semi-disappointed with that one and never finished it. Being a fan of action over story, I find that some of the most memorable characters in some games are important gameplay wise. If they have a unique set of abilities, or simply take the edge off of battle (ie Mort), you pay more attention to them, and from their you’ll begin to pay more attention to their part in the story. I think this is also why I don’t care for any character in FF7: they’re nothing more than stat sheets and cliche dialogue to me, hence I don’t remember anything about them or their plight. I’m not sure how I missed this the first go around, Jay, but great article. I’m with you all the way about characters staying with me long after I forget clicking the fight command, or hopping on my 50000 goomba. I still appreciate Christian’s comment about how important gameplay is to making characters worth caring about, though. Even games without any real narrative at all in the traditional sense can form strong ties with the characters they contain by way of what they do. I will always remember my wizard in The Four Magical Crystal of Trazere as a cackling, psychopathic madman because of his (my) propensity for “accidentally” blasting his fellow adventurers at inopportune moments, and my bard as a well meaning but generally useless meat shield fit only for singing songs in a high nasally voice for the few moments it took him to die and then carrying his own body (a great bug in the game) through the rest of the dungeon. This is a game with only the barest semblance of characterization (I think each class gets a paragraph in the manual), but through the actions and abilities of the characters involved it creates an endearment that is just as genuine as the one I feel toward Yorda or James Sunderland. That’s a good point, TT. I actually developed the Shining Force characters in my head based off how they handled in combat when I was just a wee boy of 11 (damn was Ken a klutz). I wonder if my willingness to do so has diminished because I expect more from games what with silicone chips and all these days or if my imagination is just crappier.